I first read Eight Days of Luke when I was about nine, not long after it had come out. It was just about the best book I had ever read, and from that point on and on the basis of that book only, Diana Wynne Jones was my favourite author. 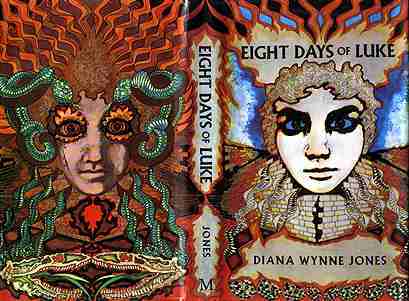 I checked every library or bookshop I entered for other books by Diana Wynne Jones. Never being quite sure whether I would find her under ‘W’ for Wynne, or ‘J’ for Jones meant that the disappointment of finding no trace of her was always delayed till I had thoroughly checked both places, as well as the letters either side in case a book had got misplaced. But although I did find Charmed Life (quickly another favourite), there was generally no sign of her. So I read Eight days of Luke again. And again. I probably got it out of our library at least ten times (why on earth didn’t my parents buy it for me? But somehow books seemed too expensive in those days to actually own!) It’s not hard, even now, to recapture that sense I had as I read it that here was something completely out of the ordinary – utterly compelling and magical. It’s the particular combination of the ordinary everyday world with the world of myth that marks out a Diana Wynne Jones book – rarely are her books completely set in a fantasy realm, and even when they are, there is a kind of matter-of-factness at the heart of what happens. David, the protagonist of Eight Days of Luke, is an ordinary schoolboy, in the horrible situation of being dumped with a whole bunch of rather selfish and unpleasant relatives in the school holidays because his parents are dead. One particular holiday, thoroughly miserable and angry, David decides to curse them. His curse, all made-up words and emotional release, suddenly takes on a life of its own, a combination of ‘fierce terrible words’ that ‘asked to be said’. As he finishes declaiming them, the garden wall comes crashing down around him, and a strange, red-haired boy appears in the ruins – Luke. From then on, David’s life changes, immensely for the better, although Luke gets him into all sorts of scrapes, and draws the attention of some very mysterious and powerful people: Mr Chew, Mr Wedding, Mr Fry. It soon becomes clear that David isn’t the only one with difficult relatives – these people are after Luke for something terrible he’s done, and only David can save him, by somehow finding the ‘object’ that Luke stole, without knowing what it is. Anyone who is familiar with the Norse legends – and when I first read the book, I had thoroughly absorbed Roger Lancelyn Green’s magnificent Myths of the Norsemen – realises quite quickly that Luke is the Norse trickster god, Loki, master of fire and mischief. It follows that Mr Chew is Tyr, Mr Wedding, Woden, and Mr Fry, Frey. Suddenly, it’s as if you are reading the book with double vision: the ordinary and the mythological, the mundane and the magical, side by side – and it’s this, I think, that makes Diana Wynne Jones’s books get under your skin in such a thorough way. It’s impossible, after that, not to have the sense that only a thin veil separates your everyday life from the world of magic and myth. Any time, any day, you might just enter an amusement arcade and find yourself in Valhalla, or cross a bridge and realise it was an echo, a ghost, of Bifrost. Unlike with Harry Potter, ordinary people are not forever walled off from the magical world as unknowing Muggles – they are always just one step away from diving into or being caught up in the magical or mythological. The effect of this revelation at the age of nine was a completely exhilarating ‘extra sense’ of magical possibilities in the everyday world that has never left me. For me (as for Neil Gaiman) it makes Diana Wynne Jones simply the best writer of magic for children there is. And although I have now managed to find and read (and re-read, frequently!) almost everything she’s ever written, Eight Days of Luke is probably still my favourite book. C. J. Busby was brought up on boats and in caravans in the southeast of England and north Wales. She lived in south India for a year for her PhD, and then taught Social Anthropology at universities in Edinburgh, London and Kent. She lives in Devon and has three children and currently works on environmental issues with schools, and is a copyeditor for an academic press. Her first picture book text, The Thing, was shortlisted for the Nickelodeon Jr national Write a Bedtime Story competition. Lovely post! I have this book in an old Puffin edition, and remember how much I loved it - though my own favourite Wynne Jones book back then was 'Dogsbody', and today it might be a difficult choice between her semi-autobiographical 'The Time of the Ghost' and 'Fire and Hemlock'.